There are certain types of people who just go absolutely nuts over anything white and gold themed. If you are one of those people, well, you have amazing taste. Let’s face it, white and gold is just so interesting yet clean and classy. It just is one of the best color combinations to decorate with if you want to elevate the look of your home. The best part is, as long as you use just touches of gold in your design, you can carry it throughout your house and have it look fantastic! I really love the combination of the round vanity mirror with the rectangular cabinets. Genius! This office is a great example of how you only need a few big statement pieces to make a room magical. Can you imagine how this bathroom would look without this brilliant design? True talent right here! I have always adored two toned cabinets as they add so much interest without overwhelming you with one color. Want something that could go in a beach house? This design is nice because it isn’t too showy or modern. The textures in this design go so well with each other from the smooth tub to the soft looking curtains and geometric tiling. This counter top is so unique and gorgeous! Also, look at that flooring! I have never seen anything like it before. Wow, this is just so luxurious looking! I love how they carry the gold throughout the room with that strip that travels all around the perimeter. 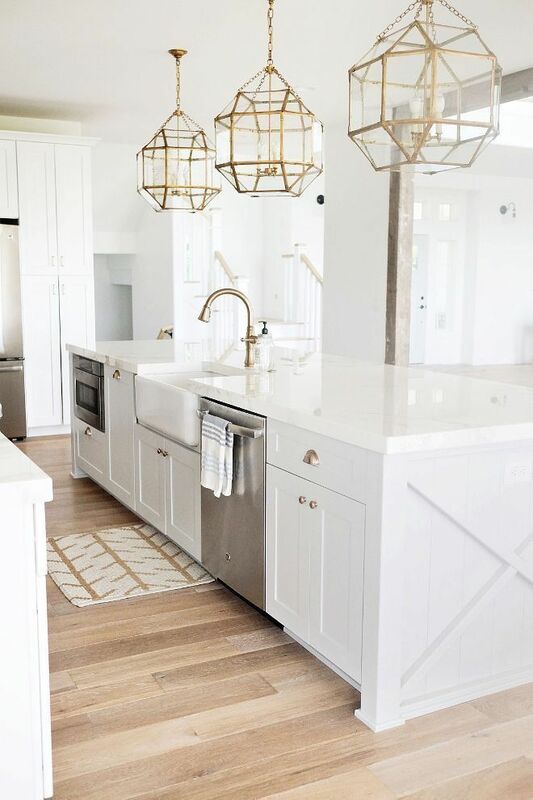 A kitchen like this is definitely for you white kitchen fans out there (you know who you are)! Who says you can’t have a themed everywhere? Really though, who has a closet this enormous! This one has to be one of my favorites. It is a modest and adorable take on the whole white and gold look. That kitchen island is HUGE! If you are like the majority of us, no worries, I am sure this would look stunning in a smaller kitchen as well! I feel like this is something I would find in an Ikea catalog. No matter! I love Ikea so that is likely why I am obsessed with this! The greenery really adds a nice natural touch to this bathroom! White subway tile with a dark grout is something that has really grown on me. I think it looks super nice when paired with smoother textures. Now, I am a crazy woman when it comes to blue kitchens. With gold though?? This is a dream come true! I think white and gold themes are a universally loved interior design choice. I could look at photos like these all day if I had the time to. What are your favorite white and gold designs?